The conflict in Syria has created one of the most serious and daunting humanitarian crises in decades, generating needs across the region that stretch beyond description. Constant, deadly conflict is destroying lives, families, and communities. Today, you’d be hard-pressed to find a family in Syria that hasn’t been affected by the catastrophe. Well over one third of Syria’s pre-conflict population of 22 million is living in hard to reach and besieged areas, or has sought refuge elsewhere in Syria. Meanwhile, 1.7 million Syrians are estimated to have fled to Turkey, while 1.2 million have gone to Lebanon, another 625,000 have sought refuge in Jordan, and 245,000 went to Iraq. And, as was widely reported in the media recently, the refugee crisis stretches well beyond the Middle East, with European nations, in particular, struggling to cope with the influx of tens of thousands of desperate and vulnerable children, women, and men – from Syria and elsewhere. The International Committee of the Red Cross (ICRC) is working hard to respond to the humanitarian crisis inside Syria and in the surrounding region. The ICRC is the lead actor within the International Red Cross and Red Crescent Movement that works in war zones. Present in 80 countries worldwide, including Syria, Iraq, Lebanon, and Jordan, we are mandated by the Geneva Conventions to protect and assist the victims of armed conflict and violence. On the ground, we work in close cooperation with the Syrian Arab Red Crescent (SARC) and National Societies from neighboring countries, such as the Lebanese Red Cross and Jordan National Red Cross Society, to provide urgently needed assistance to millions of people in dire need of help. In Syria, during the first six months of this year alone, the ICRC and SARC provided food to 4.7 million people, clean water for 16 million (almost the entire population), health care for 32,000 displaced people, hygiene kits (soap, blankets, towels, etc.) to 800,000 people, and learning supplies to over 19,000 children displaced by the fighting. We also received 1,000 tracing requests from people seeking to locate their relatives. More than four years of nonstop fighting has also severely affected the Syrian health-care system. Dozens of medical facilities have been destroyed and there are not enough qualified doctors and nurses, or decent medical supplies left to cope with the scale of the needs. The ICRC provides life-saving medication and health services to the sick and wounded. In neighboring Lebanon this week, the ICRC carried out its largest food distribution for Syrian refugees since the crisis began. Around 10,000 refugees in northern Lebanon received food parcels designed to last a family of five for a month, including sugar, olive oil, vegetables, tuna, white beans, and rice. Hygiene items were also given out. The distribution was supported by the Lebanese Red Cross, and food was also given to Lebanese families who have been hosting the refugees in the area of Dreib Al Awsat in the governorate of Akkar. Visit the ICRC’s special web section on the Syrian crisis to learn more about our work to support people trapped by the conflict or who have been forced to flee (and how you can help us help them). People looking for missing migrants in Europe can also use the ICRC’s “Family Links” site to search for their loved ones. Follow what the leaders of the ICRC have to say about migration via Storify. The extreme hardship endured by millions of people inside Syria – and by the scores of refugees who have fled the country – continues to grow by the day. The shocking images of a drowned three-year-old Syrian boy lying face-down on a Turkish beach last week came to symbolize their plight, while highlighting the tragedy unfolding along Mediterranean shores. The ICRC’s sister organization, the International Federation of Red Cross and Red Crescent Societies or IFRC, which is charged with coordinating the Movement’s response to natural disasters, health crises, and other emergencies, stresses that “beyond migration statistics, there are lives,” and they are calling for a stop to the indifference towards “people on the move”. According to their interactive platform dedicated to migrants, of the 232 estimated migrants worldwide, almost 60 million are thought to be forcibly displaced. “That’s 60 million tragedies,” the President of the ICRC, Peter Maurer, said in a tweet. “People flee their homes for a reason. Wars must end so they have the choice of staying home,” he added. Like the drowned Syrian boy that caught the world’s attention, half of the world’s refugees are said to be children. 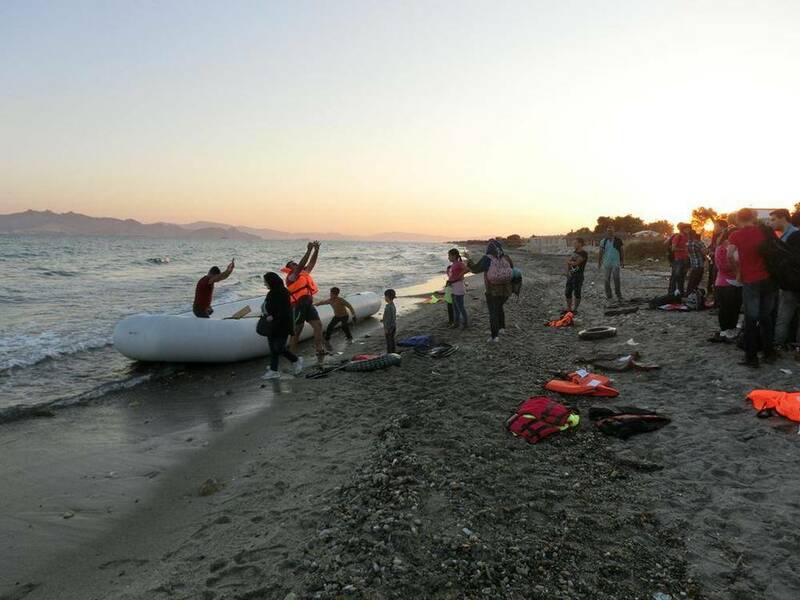 Earlier this year, 21 National Red Cross Societies from the European Union sounded the alarm over the number of people dying in the waters of the Mediterranean while trying to reach safe harbor. Across the Middle East and Europe, National Red Cross and Red Crescent Societies are on the front line of responding to the growing migrant and refugee crisis. From Spain and Italy to Greece and Turkey and beyond, staff and volunteers from the respective National Societies are working tirelessly to help increasing numbers of people arriving every day. Over the past weekend, the Austrian Red Cross supported 15,000 people, who had crossed over the border from Hungary on foot and by train and bus. The Hungarian, Macedonian, German, Serbian, and Swedish Red Cross Societies are also actively responding to the crisis. A similar emergency appeal was made in May to help the Italian Red Cross bring assistance to the tens of thousands of migrants and refugees landing on Italy’s shores. Since then, the crisis has only worsened, with 3,000 migrants arriving at Italian ports over the space of just three days during the first week of September.